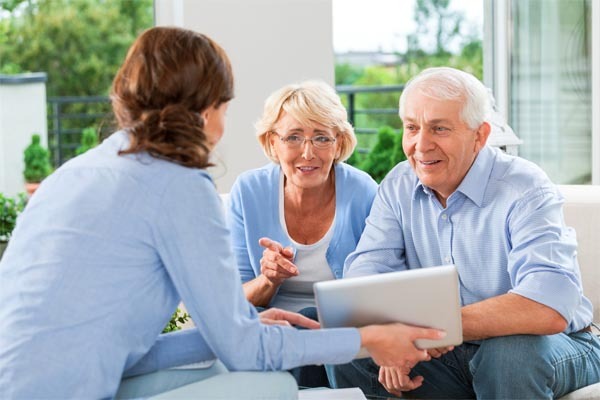 Choice Connections Senior Housing Advisors have extensive inside knowledge of the senior care industry which allows them to save families valuable time. 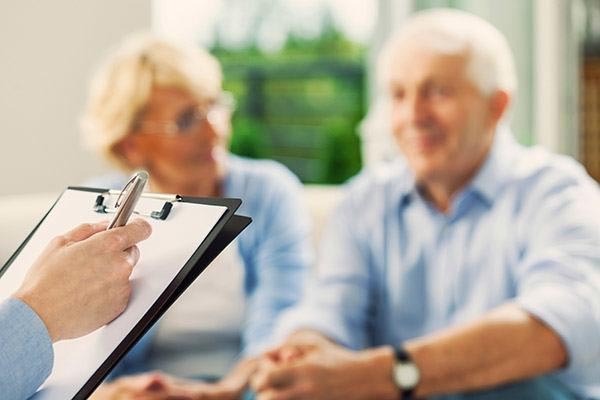 Our professional team of senior housing advisors examine each facility for their ability to accommodate a variety of needs: pets, smoking, transfers, diabetic care, special diets or any specialized need such as tube feedings, injections or wound care. No need to tour a community that is not a “best fit” or one not financially appropriate. Choice Connections may offer additional “choices” of smaller, more intimate homes that are more difficult for families to find. We devote ourselves to being value-focused with special attention on the fine details to assure placement in a high quality home that best meets your needs. Choice Connections is a FREE senior housing advisory service. Whether you are looking for Assisted Living, Residential Care, Independent Living, Nursing Home or Alzheimer’s/Dementia Care, the search to find the “perfect fit” home has never been simpler. Our team of experienced, compassionate senior care experts will help you explore and understand the most appropriate care and funding options. 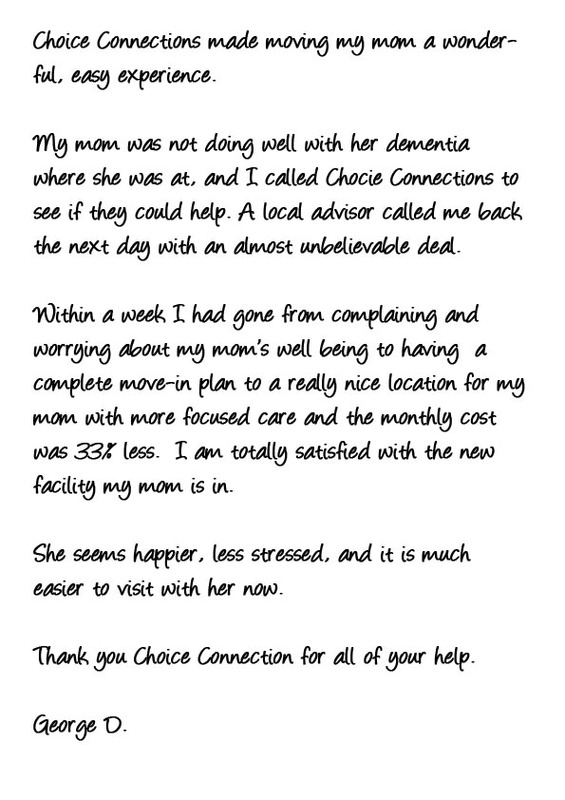 Because we are a community-based service, Choice Connections has extensive knowledge of the local senior care industry which allows us to save families time and stress. Our consultants are familiar with each community’s ability to accommodate various needs, the amenities offered, and the range of costs for each. Using this knowledge, Choice Connections can identify those communities which will best meet your needs. Our unbiased guidance will give you the information you need to make an educated decision so your loved one can find the perfect place to call home. Choice Connections is dedicated to serve each client in a holistic manner. We consider their mental, spiritual, social and physical well being in order to match them with the very best community that will foster their quality of life. At Choice Connections, we take pleasure in guiding our clients every step of the way. The Needs Assessment – Personalized assistance is Choice Connections’ trademark. Understanding individual preferences, health care needs and finances are essential in order to narrow the search to find the perfect fit home. Education and Recommendations – We will save time by guiding families through the maze of options finding the most appropriate homes that meet their needs. Our team of experts will provide information on all funding and health care options. Tours and Transition– Our caring professionals coordinate tours and personally attend to all the details. As advocates, we act as liasons with the facilities to ensure a smooth transition. Follow Up – Our compassionate and dedicated professionals follow up care further demonstrates our commitment to excellence. You can count on us for unbiased, experienced-based advice that puts you and your loved one first. Why use a Choice Connections instead of an Internet referral service? Unlike some web-based directory services, Choice Connections is a personalized service. Our senior care consultants go the “extra mile” by personally accompanying our clients to each retirement community. All of our senior care consultants are bound by a code of conduct, offering all care options regardless of payment source and always doing what is in the best interests of our clients. Choice Connections will assist families in investigating all funding options available to them such as the Veteran’s Aid and Attendance Pension or Reverse Mortgages. How do I know which community is best for my loved one? Choice Connections believes in the philosophy of “the least restrictive” environment yet offering “choices” that may accommodate future long-term care needs. The pros and cons of the options are discussed in advance so there are no surprises that might necessitate another move. How can Choice Connections provide this valuable service at no cost? Choice Connections offers its services to seniors and their families FREE of charge. This is made possible through the financial contributions of local senior housing communities, many of whom reimburse us for our services. How do I know if my loved one requires an independent or assisted living community? Independent communities are suitable for those who are independent with bathing, dressing, grooming and eating. Some independent living communities may offer additional services such as laundry or meals. Assisted living facilities will accommodate those individuals requiring more assistance with activities of daily living such as meals, bathing, dressing, grooming, medication management and may include around the clock nursing care. It is important to know that “assisted living” is not a government defined term. Amenities offered by assisted living communities vary from community to community. Choice Connections can assist seniors and their families uncover these differences in order to make equitable comparisons. Are Assisted Living services covered by insurance or Medicare? Most Assisted Living is paid for by private funds. Medicare does not pay for long term care, however Long Term care insurance is accepted at most Assisted Living Facilities. Some Assisted Living properties have a limited number of Medicare beds. However, this varies by community, so it is best to ask your Choice Connections representative. Choice Connections seems like a great service, how do I get started? The first step in our process includes a personal consultation with your local Choice Connections Advisor at no cost to you. In our meeting, we will thoroughly discuss your care needs and work with you or your loved one to determine how best to meet your requirements. At Choice Connections, extraordinary service sets us apart from other companies who provide services for seniors. Whatever your care needs, Choice Connections is there for you, always striving to exceed your expectations.